Italy Review is the central website of the Italy Review Network of guides to different Regions, Cities and Islands of Italy. There are currently 38 websites including this one from which you can quickly and easily access any of the others. The websites are all written exclusively in English and designed to provide ideas, inspiration and guidance for visitors to Italy. Throughout the pages of the various websites you'll find thousands of original images and as the websites evolve there will be more features added including travel advice, articles and useful tourist information. The websites and the photos are the fruit of my own personal travels around this great country since 2013 when I started the Ischia Review website. In the years that have followed I've visited in excess of 2,000 different places be they towns, islands, cities, beaches or other places of beauty, hungrily snapping away wherever I've passed. I still have an enormous list of places I want to visit in the country and I'll be updating all of the websites with more photos and written content along the way. I hope, that through the websites and the various social networking pages, you'll be able join me on this wonderful journey and get involved with comments and e-mails. So for now, I hope you enjoy exploring Italy through these web pages and find some ideas for places to visit. To get in touch with any questions or to comment on the project, please feel free to drop me a line at info@italyreview.com and I can't wait to hear from you all! Dion Protani, founder of the Italy Review series of websites. HERE'S SOME OF WHAT YOU CAN FIND ON ITALY REVIEW! Stretching some 650 kilometres, the River Po is Italy's longest river, spanning the northern regions of Piedmont, Emilia Romagna and the Veneto. ​At its widest point the opposing river banks are more than 500 metres apart. Starting at Pian del Re in Piedmont's Cottian Alps, the river flows in an easterly direction and passes through the cities of Turin (Torino), Piacenza, Cremona and Ferrara as well as dozens of smaller towns. The river also has channels which flow into Milan's "Navigli", a series of man-made canals. ​Shortly after passing through the city of Ferrara, the River Po widens out into the Po Delta and eventually empties into the Adriatic sea just south of the Venetian Lagoon. 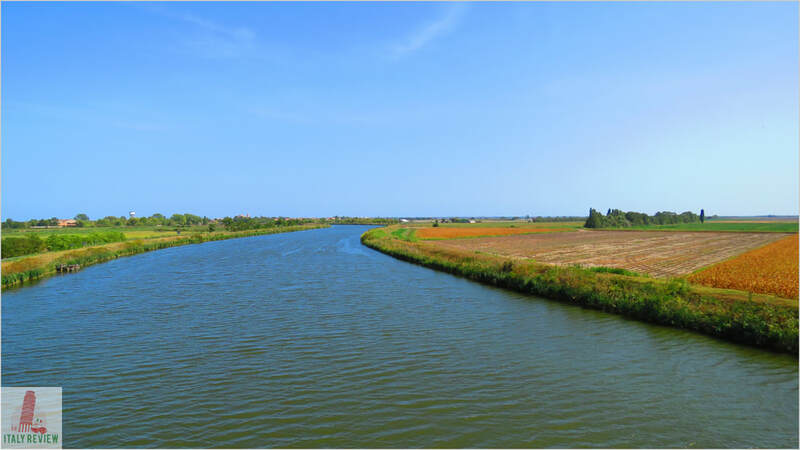 The Po Delta is a regional park split between the two regions of Emilia Romagna to the south and Veneto to the north; an important area for wildlife, the Po Delta has been inscribed in the UNESCO World Heritage List since 2015. Italy Review has teamed up with Booking.com to provide a wealth of accommodation ideas for every region of Italy. On the Hotels in Italy page you'll find a search box where you can enter your travel dates and then filter the various options to find the most suitable solution for your needs. With genuine User Reviews you can really get a feel for each place that's listed and avoid any disappointment. There are also very favourable booking conditions such as free cancellations on most deals and a price match guarantee if you find the same room for a cheaper price on another website. There are so many beautiful sights just waiting to be discovered in Italy. I've listed cities, islands, regions, seaside towns, hill towns, lakes, ski resorts and much more all in one place.